DiMarzio Model J_ pickups reproduce the warmth and roundness of the traditional Fender_ Jazz Bass_ sound with increased power and hum-cancellation. The additional power translates into a bigger sound that emphasizes the resonant character of the instrument. The DiMarzio Model J_ pickup�s sensitivity and deep tone are also the perfect complement to fretless basses. Double-stop glissandos and delicate violin-style vibrato speak with a classic, woody voice simply by backing off slightly on the tone control. For an even more varied choice of tones, pair a bridge position DiMarzio Model J_ with a DiMarzio Model P_ pickup. The warm, fat tone of the DiMarzio Model P_ plus the tight punch of the DiMarzio Model J_ open up the sound of any bass. Neck and bridge positions. The DiMarzio Model J_ was designed to fit the original Fender Jazz Bass, which has neck and bridge pickup cavities of two different sizes. Some current basses use the same length pickup in both positions. The DiMarzio Model J_ set, DP123, consists of two pickups of different lengths, with the neck pickup shorter than the bridge pickup. 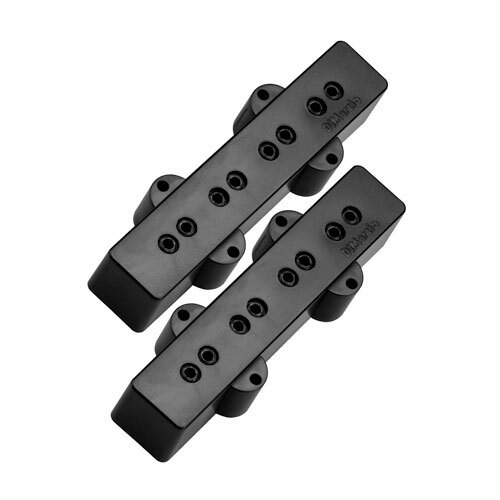 The pickups are also available individually as DP123S (short) and DP123L (long) if your bass requires either one size pickup or the other. Please refer to the dimensions link for the correct choice for your bass. Unlike traditional Js, each Model J_ is individually humbucking. It's not a stack: each coil picks up one pair of strings. By doing it this way, we keep the resistance down, and the tone clean and clear.